Personalised External Aortic Root Support (or PEARS) is the name given to a very specific operation. By taking the exact measurement of the individual person’s aorta from a CT or MRI scan, a replica of their own aortic root is made by 3-D printing. On the 3-D copy a made to measure mesh support is fashioned. It requires an operation to put it in place, and specialist surgical skill. Once in position the tissues of the body grow into the mesh. It is fully incorporated making a composite aortic wall. The aorta is from then on held at a safe size. If it is already abnormally large in size, the external support can be engineered to reduce it by say 5% or 10%. Fig. 1. Four steps in personalised external aortic root support. a.Measurements are made from the patients own digital images, either computed tomography (CT) or magnetic resonance imaging (MRI). b.The measurements are used for CAD modelling (computer aided design) and a replica made by 3-D printing. c. The mesh with 0.7 mm pores is made to fit snuggly. d. The mesh is position at operation to include the while length of the aortic root and ascending aorta. 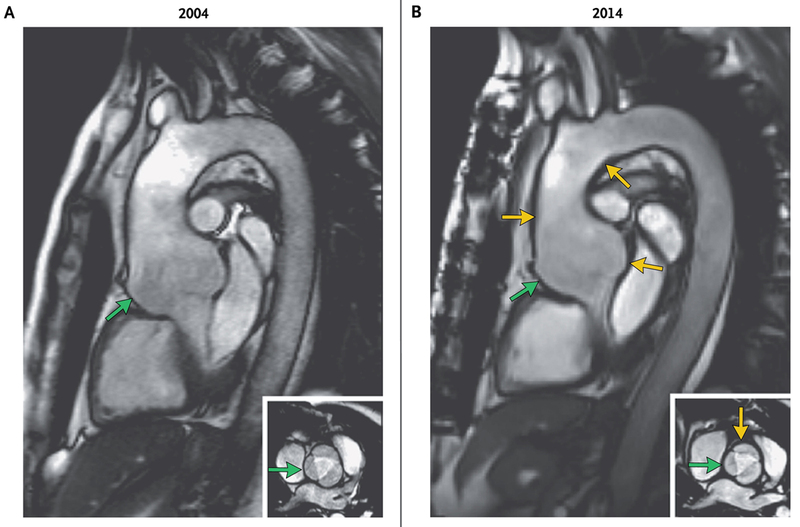 This sort of aortic root aneurysm is characteristic of Marfan syndrome but occurs in a range of related conditions. There is no medical treatment which reverses the problem of aortic root aneurysm. In people with Marfan syndrome who have an aneurysm in the aortic root it is likely to be the cause of death in two thirds of them if the problem is unchecked. That is why a preventative operation is advised. For over 50 years it has been possible to operate to remove the dangerous part of the aorta and the aortic valve. This operation is named total aortic root replacement, also known as a ‘modern Bentall’. These days it can be done at very low risk but it is a big operation and usually includes a mechanical valve and that means that life-long anticoagulation with blood thinning medicine is essential. The Bentall remains the standard operation and is applicable over the widest range of circumstances. From about 30 years ago surgeons developed means of replacing the aortic root while sparing the valve. The operation of valve sparing root replacement (commonly known as the David operation, again after a surgeon who devised it) is increasingly popular. A rather similar approach is used in the so-called Florida sleeve. Conserving the natural aortic valve avoids anticoagulation but the valve may never be quite as good and if it begins to leak, another operation may be needed. This can happen in about 1 in 10 people. Valve sparing root replacement is not possible for every patient. The PEARS operation is a third way and has now been performed in more than 100 people since its invention in 2004. Fifty operations were performed from 2015 to 2017 as doctors and people with Marfan syndrome have gained confidence in this more conservative approach to the problem. It is at present limited to relatively few specialised surgeons but in addition to British centres it is being done in several European countries and as far away as New Zealand. Fig. 2. A pair of images 10 years apart. The mesh/aortic composite can be seen to be a little thicker (yellow arrows) but would probably pass as normal were it not for the paired images. The green arrow indicates the critical diameter for maintaining aortic valve competence which is unchanged over 10 years. The team developing PEARS regularly report updates on their results and scientific information as the research continues. It has proved to hold the aortic size and the function of the valve very consistently over time. In 2017 the inventor of the operation, Tal Golesworthy, who was the first person to have this device implanted, has an aortic root which has remained unchanged in size over 13 years. Personalized external aortic root support: a review of the current status.